The first gold discovery was made at Pierce in northern Idaho, and it didn’t take long for additional strikes to take place. By the mid-1860, miners were staking their gold claims in nearly every corner of the state. Murray holds the interesting distinction of being perhaps the last “gold rush” in the lower-48 states. The richest gold deposits were found at Prichard Creek and Eagle Creek, although gold was mined starting all the way down at the Couer D’Alene River. Some large gold nugget have been mined at Murray. Although, as rich as the gold mining was here, it was hugely overshadowed by the silver discoveries that were made at nearby Wallace and the Silver Valley. The gold rush to Florence was truly a “boom and bust.” When news of gold discoveries first occurred, it was estimated that close to 10,000 miners converged on the remote mountainous area in search of gold. They certainly found gold, but it rush was short-lived. The placers simply weren’t rich enough or extensive enough to sustain that many miners. Most of the good ground was claimed up almost immediately, and within a year there were only a few hundred gold miners in Florence. Gold was first found at Warren Creek near the present day town of Warren. Mining went on for many years here, with many rich lode mines being found in addition to the rich placers in Warren Creek. Floating dredges churned up the valley floor for miles and miles here. The remnants of the old tailing piles are still visible today, even though these stopped operating over 60 years ago. Today there are a handful of small mining operations, but the heyday is long over. Not far from Warren you will find the tiny town of Burgdorf. A decent amount of mining took place in this area during its peak, primarily along the Secech River at Secesh Meadows. A bit of placer mining was also done on Summit Creek and Ruby Creek. Today, most people don’t even know that any mining took place here. It is much more famous for the lovely Burgdorf Hot Springs, a popular destination for people in McCall. 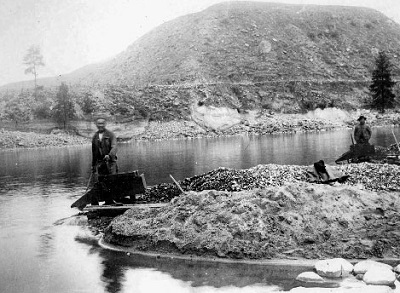 A Chinese miner using a rocker box to recover placer gold from the banks of the Salmon River in Idaho around the turn of the century. The Salmon River is shown on the map above to represent, not a specific town, but rather the thousands of miners that worked the gravels all throughout this river that flows for over 420 miles. Gold occurs in nearly the entire reach of the river! Early miners worked the all throughout the river, but the stretch that flows from Riggins to Whitebird was placer mined extensively. There is still lots and lots of gold left to be found in the Salmon River, but remember that you won’t be able to do any mining in the Wilderness sections. The Yankee Fork flows into the Salmon River at Sunbeam, near the popular recreation town of Stanley. About 10 miles of the river was dredged. 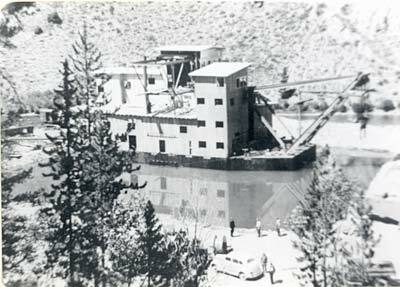 The Yankee Fork Gold Dredge still sits in place, and it is one of the better preserved dredges in Idaho. The Yankee Fork Gold Dredge in action. The early mining camps were at Custer and Bonanza. While a considerable amount of gold was mined in the Yankee Fork, gold nuggets are rare. Most of the gold is very small. The dredge missed quite a bit of it because the gold is so fine, so you might get lucky with your gold pan! Pearl isn’t much to see today. In fact, despite being just a short drive from Boise, very few people have even heard of it. When I was a kid there were still a few old buildings but they have disappeared in recent years. A relatively small amount of placer gold was found in Willow Creek, but this is primarily a lode district. Gold was found scattered throughout the hill surrounding Pearl in all directions. There are hundreds of small prospects still there, but active mines there are only a few. Nearly all of the land here is private. A small hydraulic mining operation in the Boise Basin. 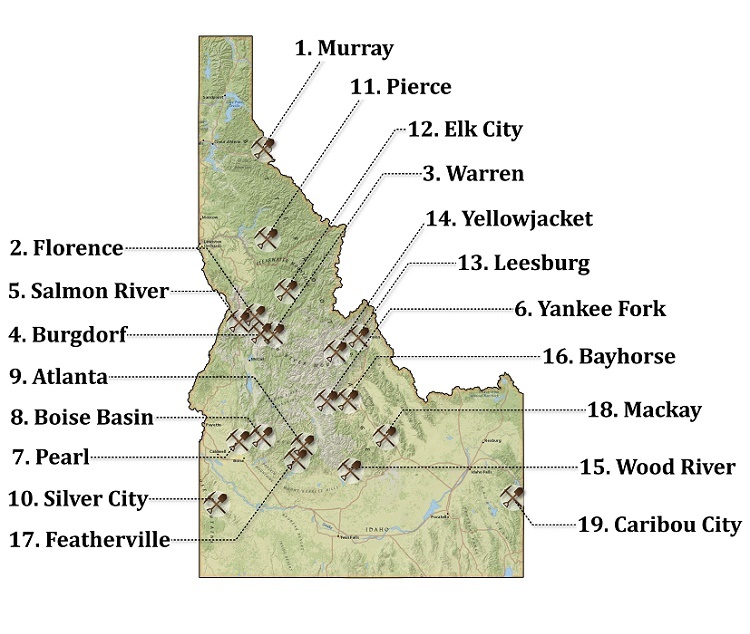 The gold discoveries in the Boise Basin were the richest in Idaho. The main mining towns in the Boise Basin were Placerville, Centerville, Pioneerville, and Idaho City. Nearly every gulch would produce some gold here. At the peak of mining in 1863 there were well over 25,000 miners here. 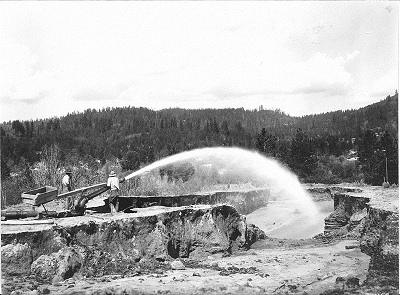 Hydraulic mining was done throughout the Boise Basin. Later it was dredging along Mores Creek and Grimes Creek that produced the most gold. Today you will still find plenty of gold miners panning along the creeks in search of some color in the bottom of their gold pans. Atlanta is a remote mining town on the southern edge of the Sawtooth Wilderness. It can be accessed from Boise via the long, bumpy road up the Middle Fork of the Boise River. Others prefer to access it by way of Featherville. The gold was abundant in the Boise River and Yuba River. Most any creek around Atlanta will produce a bit of gold. It was the lode mines that really made Atlanta a noteworthy town though. Gold ores were mined here for many years with silver as a by-product. The remoteness of this mining camp was a challenge for the early miners. Silver City is one of the best preserved mining towns in the West, and a very popular tourist town to visit during the summer. As the name would suggest, this was mainly a silver town, but a lot of gold is found here too. Jordan Creek has gold all throughout, and many of the small tributaries and dry gulches in this area contain gold too. Downstream a ways is the large DeLamar Mine, an open pit operation. This mine is no longer in operation, but there is still many active lode mining operations in Silver City. This small northern Idaho town has the distinction of being the site of Idaho’s first gold rush. Gold was found in Orofino Creek and surrounding mountains. This gold rush was relatively short-lived, as the extent of the mining was not very large. It did bring a lot of attention to Idaho though, and is the reason that later discoveries were made in the Clearwater River and Salmon River that would eventually lead to further gold discoveries in Idaho. Elk City was the epicenter of mining that took place all throughout this area. Gold was mined from the South Fork Clearwater River, Red River, American River, and Elk Creek. Unless you’ve made it a point to go there, Leesburg is a town that you likely haven’t been to. Some gold was found on Napias Creek and Arnett Creek several miles west of Salmon, Idaho. The town of Leesburg sprang up to supply the miners. Gold here wasn’t too extensive, and certainly didn’t attract the attention of discoveries such as the Boise Basin in southern Idaho, or Virginia City and Bannack in Montana. Yellowjacket is another remote mining town that you would have to try to go there to ever find it. It is deep in the Idaho wilderness. Gold was found in 1869 on Yellowjacket Creek, well after most of the other gold rushes in the state were winding down. After the placers were exhausted, several mines were developed to work the quartz veins. There are some great old buildings still standing in Yellowjacket, including a 5-story hotel that housed the workers of the early mines. This would be a great place to explore. It is only accessible in the summer for a few months. The mines of the Wood River are found around the towns of Ketchum and Bellevue. These were primarily silver and lead mines, but a considerable amount of gold was found as a by-product. One of the better ghost towns in Idaho is Bayhorse, located not far from Challis. This certainly wasn’t the biggest mining area in the state, but the buildings are well-preserved and can be seen from the road up Bayhorse Creek. Be aware that most of the buildings are located on private property, so keep a respectful distance and don’t trespass while you explore this area. Other mines are located a few more miles up Bayhorse Creek. Gold was mined in the Feather River and South Fork Boise River, and a small area around Featherville was even dredged. As you move up the Feather River, other gold discoveries were made on Bear Creek at Rocky Bar. Featherville is just over the mountains from Atlanta, which was a larger gold strike. The mines at Mackay were primarily after copper, silver, and zinc, but due to the sheer volume of material that was mined they also recovered a good amount of gold. This is one of the few true “gold towns” that sprang up in Eastern Idaho. In general, the eastern section of the state is not very rich with gold, but indeed some gold was found at Caribou City. Various hardrock mines were scattered across Caribou Mountains, and there was a thriving mining town here for many years. Next: 6 Rivers in Idaho that are Still Loaded with Gold!